A million acts of kindness--that's the power of the Code. Speaking of big numbers, Salia Jakuard amped up her holdings with a purchase of 500 additional shares of New Order stock. This sent us over the 1 trillion 106 billion isk mark and earned her a Supreme Protector's Tip of the Hat™. I concur. We've come a long way, but we still have a loooong way to go. Onward! 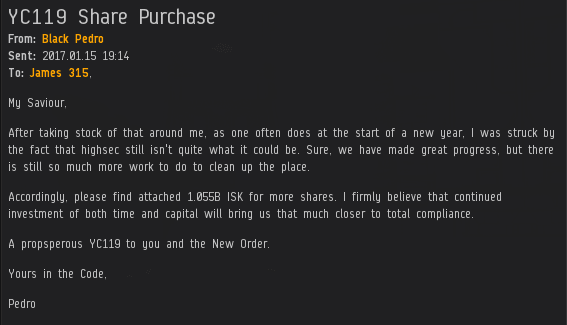 Black Pedro helped us advance the cause of highsec with his purchase of 1,055 additional shares of New Order stock. 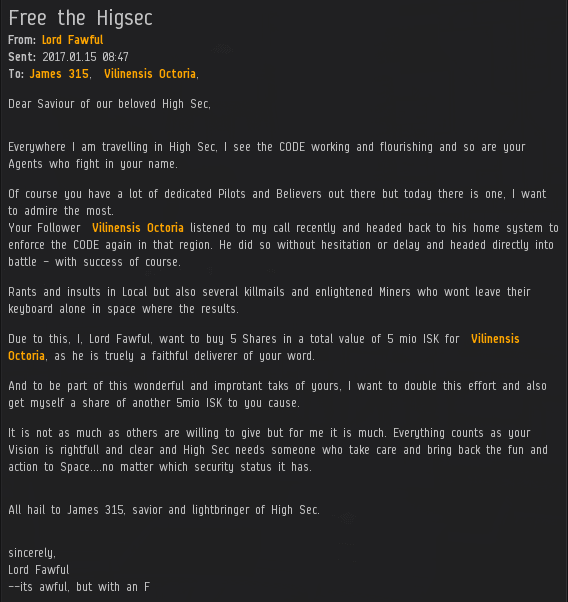 This brought us over the 1 trillion 107 billion isk mark and earned him a Supreme Protector's Tip of the Hat™.